Relatives of edible onions many are ornamental, hardy and sun loving. These include garlic and leeks. They are all found in the Northern Hemisphere. Allium stems range in height from 6 inches to 5 feet and bear small flowers in round clusters. Flowers bloom in late spring through the summer. They grow well in rich, sandy loam with plenty of moisture. Garlic is a very old food which is grown almost the world over, and is suitable to a variety of climates. It is bothered by relatively few pests. It likes well-drained soils, and won’t do well in dense, overly clayey ground. When planting, separate cloves. 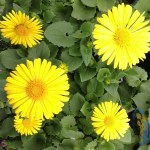 Plant them 4-6″ apart, and cover with 2″ of soil. If you are planting elephant garlic, the cloves of which are much larger, plant them 4-6″ deep and 6-8″ apart. In the Northwest, plant in October. In the South, plant anytime from November to January. In the spring, water and fertilize well, but decrease watering as harvesting time nears, to cut down on mold growth. Cut off woody seed stems at the top leaf to redirect energy to the bulb. 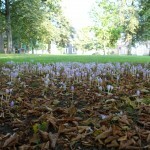 Harvest the bulbs when the leaves dry out or fall down in mid-summer. Tie the plants in bundles in a cool, well-ventilated place.